A new LFIG report calls for freelancing to be placed at the heart of the Labour party’s policy agenda. “Freelancers and the self-employed deserve to have their own policy agenda and framework” says Philip Ross author of the new Labour Finance and Industry Report entitled ‘The Freelancing Agenda’ and he suggests that. “Labour is a strong position now to lead on this agenda”. The report, published on Monday 15th September, will be followed by a special fringe event launch at the Labour conference. It aims to construct a policy framework by proposing a charter for freelancing along with three other key policies designed to empower freelancers and bring them the recognition they deserve. The report is published as a short booklet, it looks at the size of the freelance economy, the lack of definition and recognition that freelancing faces and the evolution of the market. The report recognises that freelancers range from precariat workers through to independent professionals but there is commonality between all the groups. It discusses the evolution of the freelancing market, the need for agency freelancers to use limited liability companies. It differentiates genuine freelancers from those using the model for tax avoidance and those in forced self employment. One of the recommendations includes a well thought out proposal to create a special freelancer limited company (FLTD) which it suggests will allow some of the onerous and unachievable requirements of IR35 to be toned down. The LFIG report has been written with Prof. Andrew Burke who holds the Bettany Chair and is the founding Director of the Bettany Centre for Entrepreneurship at Cranfield University. Philip Ross is a former freelancer and a well known writer and activist on freelancing issues. He is a member of LFIG and the author of the book about the founding of the PCG – Freedom to Freelance. Philip Ross, explains “the report was able to build on both our personal experience and professional knowledge of the freelancing industry and has been supplemented by meetings with freelancer groups, trade associations and trade unions”. “We have spoken to actors, journalists, artists, pharmacists, IT workers, management consultants, construction workers, teachers, film and television workers, agencies, accountants, tax specialists and more besides”. “For too long policies of all parties have focused on the extremes of the freelance economy, tax avoidance on one hand and forced self employment on the other. This report focuses on the forgotten middle, genuine freelancers, a market that is as broad as it is wide. It offers a proactive agenda as opposed to reactionary one that will help freelancing flourish. The report offers the chance for Labour to seize the initiative and clearly differentiate itself as the most progressive and innovative party in this area”. The report and recommendations are centred on a radical and innovative Freelancers’ Charter. “We have adopted this approach because we acknowledge that freelancing has a wide constituency with independent professionals at one end and precariat workers at the other. We wanted to create a platform to enable others to innovate on”. “Above all, the Freelancing Agenda aims to kick start a proper and informed debate to help Labour build a new economy that recognises and levers the power of the freelancers and the self employed to deliver prosperity”. Almost every week I seem to come across a story in the press about some super executives and their mega salaries which are meekly justified by their board members who insist that they are worth the money. The myth is that the recovery is being driven by some sort of battalion of super star executives. The reality I feel is somewhat different. This isn’t a recovery led by the genius of these superstars but by working people from the ground, the vanguard of which are the self-employed. According to the ONS monthly Labour force survey, self-employment accounts for almost two-fifths (38%) of new jobs created since 2010 and the self employed make up almost one in six of those in work. Indeed, the RSA recently reported that the number of people working as self employed is set to out strip those working in the public sector by 2016. Unfortunately unlike our battalion of super hero executives the self-employed have not fared well in the cost of living crisis since 2010. According to analysis done by Labour their incomes have fallen on average by £2,000 a year. None of us in regular employment have done that well, with incomes falling by 9% but for the self-employed it is a fall of 14%. Labour has had to do its own analysis because the ONS figures don’t include it, so Rachel Reeves and Chuka Umunna have written to Sir Andrew Dilnot, Chairman of the UK Statistics Authority, to ask him to examine whether new measures are needed to fully take into account the earnings of self-employed people. The world of work is changing with this growth in self-employment which includes those setting up traditional businesses as well as those working freelance. Springing up all over the country are a large number of workspaces or hubs where the self-employed can come and work in a collective workspace. Some, I know, bury their heads in the sand and insist there should only be permanent full time jobs for everyone. Though people can support that sentiment, the reality is that people have lost faith in many of our institutions and the ability of business to provide them work and so are moving towards self employment for both economic and personal reasons. I met people at one of these hubs who said they would like permanent employment, but there aren’t any jobs so they are working for themselves. Yet, they noted, they feel ignored by policy makers who only pay attention to the margins of what they do by just focusing on those abusing self employment for tax avoidance or those being exploited by being forced into self employment. They want recognition, as they feel like the forgotten middle who are marginalised and outside the system. They are not employees so the unions tend to see past them or even see them as a threat. They are not all super rich, as the statistic show quite the opposite and many need to interface with the benefits system. This policy agenda and constituency hasn’t gone unnoticed. The report published by Labour’s Small Business Task Force in March 2013 (An Enterprising Nation) identified that more work needed to be done on the freelancing agenda. As a result LFIG commissioned myself, Philip Ross, as a former freelancer and Prof Andrew Burke from Cranfield University to develop the report. The report was able to build on both our personal experience and professional knowledge of the freelancing industry and has been supplemented by meetings with freelancer groups, trade associations and trade unions. The key message from the report is for policy makers to take freelancing seriously, and we have named the report ‘The Freelancer Agenda’ because it is about starting that debate and discussion around freelancing issues and what needs to be done. The report and recommendations are centred around a radical and innovative ‘Freelancers’ Charter’. The objective of the Charter is to provide a platform or operating model upon which future policy can be developed for freelancers. Such that one could consider individual polices to be the Apps that would operate on the platform. I did this because I felt that we should learn the lessons from business where Apple and others realised that success can come from developing the platform upon which others can develop the Apps. So it should be for policies. We have made a start too and issued the report with a few of our own policies or Apps and these include the creation of a Freelancing Limited Company and the appointment of a Minister with direct responsibility for freelancers. We’d encourage other organisations and groups to develop their apps or policies to work from the platform. We have adopted this approach because we acknowledge that freelancing has a wide constituency with independent professionals at one end and precariat workers at the other. We wanted to create a platform to enable others to innovate on. There is a shared agenda for freelancers and a lot common purpose between all groups. I hope that this report can help all groups come together and build an agenda for the common good. Philip Ross is a member of the Labour Finance and Industry Group. Note: The report will be formally launched at the LFIG fringe meeting at the Labour conference on Tuesday 23rd September at 5:30pm, though the report is available from the LFIG website as from 16th September. LFIG have published their new report entitled 'The Freelancing Agenda' this article explains the reasoning behind the report and the need for Labour to focus on the self employed as well as small business. Labour must be the party both of and for the self employed and small business if it is to win the next election. It is on strong ground as it has an excellent Labour Business team who are widely respected. Labour’s grassroots are being filled with those who run their own businesses, work as self employed or as freelance. It is growing to become a key constituency both within the Labour party and within society. In March 2013, Labour’s Small Business Task Force report, ‘An Enterprising Nation’, made recommendations to the Labour Party for policies to help small businesses. The report looked in part at freelancing and self-employment, and suggested that ‘greater clarity around the distinction between genuine freelancing and false self-employment is required to enable small businesses to use freelancers legitimately’. The publication of our report entitled ‘The Freelancing Agenda’, commissioned by the Labour Finance and Industry Group, comes partly in response to that. It offers a set of principles, in the form of a Charter, and some specific policy recommendations, including a new definition of freelancing for tax and other purposes, that can help Labour to update its policies for this constituency, by enhancing, not compromising, the party’s core values. Labour needs to offer both a small business agenda and also one for the self employed too. Last week Demos published a report in this area entitled ‘Going it alone’, its author Duncan O’Leary noted that “The Labour party has an uneasy relationship with self-employment. Fears of tax evasion by high earners and the exploitation of low earners dominate the party’s discourse. The policy focus is on stamping out abuse, rather than supporting those for whom self-employment is an active choice”. These are the goals of our freelancers’ charter. To provide a positive agenda for the self employed that Labour can embrace. Our report is published as a short booklet, it looks at the size of the freelance economy, the lack of definition and recognition that freelancing faces and the evolution of the market. The report recognises that freelancers range from precariat workers through to independent professionals but there is commonality between all the groups. It discusses the evolution of the freelancing market and the need for agency freelancers to use limited liability companies. It differentiates genuine freelancers from those using the model for tax avoidance and those in forced self employment. One of the recommendations includes a well thought out proposal to create a special freelancer limited company (FLTD) which it suggests will allow some of the onerous and unachievable requirements of IR35 to be toned down and will allow for clearer identification of freelancers. We have made a start too and issued the report with a few of our own policies or Apps and these include the creation of this Freelancing Limited Company (FLTD) and the appointment of a Minister with direct responsibility for freelancers. It is timely because the ONS have reported that the growth in self employment outstrips new jobs.Mike Cherry the Policy Chairman for the FSB has said that it represents a ‘structural change’ in the labour market and is here to stay. The RSA recently reported that the number of people working as self-employed is set to outstrip those working in the public sector by 2016. To write the report we have spoken to individuals and groups representing actors, journalists, artists, pharmacists, IT workers, management consultants, construction workers, teachers, film and television workers, agencies, accountants, tax specialists and more besides. Interestingly the two consistent issues coming through are for .’clarity and parity’. For the independent professionals this is clarity over their status as self-employed and parity with other businesses also competing for business. They want to the chance to compete fairly and be judged as being in business on their own account. For the precariat workers and others they want parity with other workers when they have to interface with the benefits system and clarity over how they can receive fair treatment at work. All sight the right to be paid and the right to be paid on time as key requirements. While it is outrageous to pay wages late large firms seems to get away with the late payment of small businesses. Our report concludes that freelancers are not small businesses in the traditional sense, that they are instead their own economic agents often with premium and important skills which have allowed small firms to innovate and grow. That they are drivers of economic growth. I see that in effect just as every small shop doesn’t want to be the next Tesco’s not every IT freelancer wants to be the next Google. The growth isn’t in their own businesses but elsewhere in the economy. They are not a competing shadow workforce but positive complementary one which deserves recognition and be protected and nurtured. There is a shared agenda for freelancers and a lot common purpose between all groups. I hope that this report can help all groups come together and build a positive agenda for the common good. The LFIG report offers the chance for Labour to seize the initiative and clearly differentiate itself as the most progressive and innovative party in this area and clearly identify itself as for the party for the self-employed. We encourage you to read the report, review the charter and help put the issue of freelancing and the self-employed on the agenda for the general election. 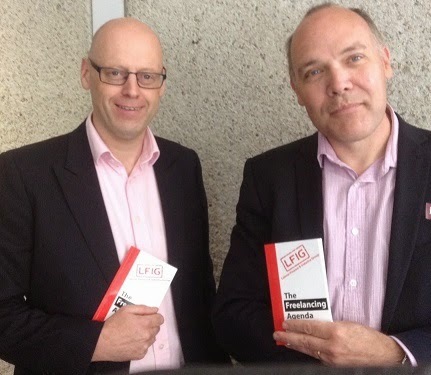 Philip Ross is a member of LFIG and the lead author the report ‘The Freelancing Agenda’. A kindle copy of the report can be found on Amazon and printed copy here. At this year's Labour Conference in 2014 the Forum is working with the Labour Finance and Industry Group to host a fringe meeting again on small business. For the third year running the premium small business event will be run by LFIG and the LSBF. Our small business event is a Labour small business event in so far as it put on by party members, the forum and LFIG who are Labour supporters and members. This year's theme is the digital economy, small business and freelancers. 5:25pm – Introduction by David Offenbach, Chairman of LFIG. This will be the conference launch of LFIG’s report on freelancing for a progressive economy. Summary details of the report will be detail with comment from a panel of freelancing experts plus Labour’s Chair of the Business Interest Group. This is the main event with a key note address from Labour’s small business minister. 3-5 minutes for each panel member, summed up by Toby Perkins. Then 30 minutes of questions from the floor. Open mic for audience to pitch ideas to previous panel on digital economy, freelancing and small business issues. The Labour Small Business Forum is a network of Labour members and supporters who work or have worked for themselves or in a small business. it isn't an official party organisation. The views expressed are those held by individuals and should not be construed as party policy. We aim to organise social events and meetings across the country and to give a fresh voice to small business with the Labour Party. People who attend do so in their own free time and entirely in their personal capacity. Our aim is to provide a place where like-minded people can meet in an informal setting. We will host drinks, dinners, speaker meetings and debates. If you’d like to be kept up to date, then please email us at visit our contact page. Our meetings tend to be private and only open to members of the group.